As an 8th grader at T.W. Hunter Middle School in Nashville, it is not unusual to find Caden Thieman out in the street spending his free time after school tossing around his football. That's what the 14-year-old was doing on Monday when his mom Beth noticed a Metro Nashville Police Officer circling the block. It was Martin Luther King Jr. Day, Caden was off from school but had no one to toss the football around with. "He's been out in the street doing that since he was five," his mom Beth said when reached by phone Wednesday. The family's yard is dotted with orange cones and mock goal post Caden uses for practice. The aspiring athlete plays safety for his youth football league. After a few minutes of playing catch by himself, Beth's mom called her over to the front of the family's home on Montchanin Drive in Hermitage. What she saw left her both stunned and shocked. "My mom said, 'Your son is out there playing catch with a police officer,'" Beth recalled. Naturally, she took out her cell phone and started rolling. 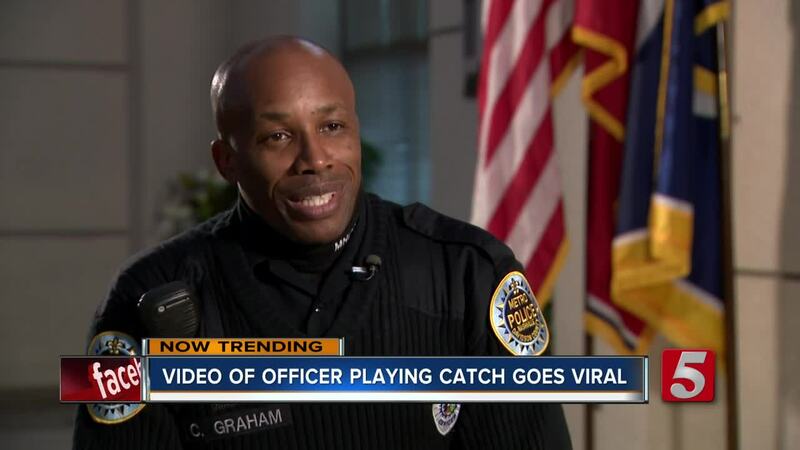 In two days, the clip of her teenage son and Metro Officer Calvin Graham has since gone viral. The two spent close to 20 minutes tossing the football back and forth, talking and laughing with one another. Caden's mom still can't believe what happened steps away from her front door, "It shows he has heart. Cops get a bad rap but they have heart. They have kids at home too. It was nice of him to take the time to do that." During a brief interview with reporter on Wednesday, heart is something Officer Graham appeared to have plenty of. "After throwing a few catches, he kept going further back and I think he realized that I was serious. The more he threw, I said to myself, “Oh, he’s good!" Officer Graham said who coincidentally has a son named Caden as well. Officer Graham has been with the Metro Nashville Police Department since 1998, he never intended for the encounter to go viral. The 47-year-old says he just genuinely enjoys interacting with the community he proudly serves. “I think that it bridges the gap of resentment other may have toward us, it shows that we do have compassion and heart,” he said. Weeks after the video went viral, Officer Bobby White from the Gainesville Florida Police Department saw this NewsChannel 5 story. He's the founder of the Basketball Cop Foundation. He said he would be shipping a footballs to Officer Graham to hand out while on patrol. They spoke for a bit on the phone last week. White said he was a "good guy."